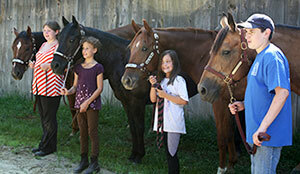 Twin Pine Farm is proud to offer an intensive English and Western riding program this summer. Our summer camp program is open to boys and girls ages 6 through 17. Whether you are a complete beginner or a polished show rider, we at Twin Pine Farm can help you learn more about horses and achieve your riding goals. In our Olympic size indoor arena, you will learn the fundamentals of horse care and the basics for riding competitively in today's show ring. Riders will be grouped according to ability. 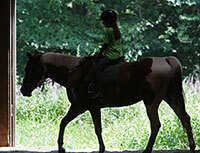 Intermediate and Advanced riders will learn the upper level skills needed to further their riding talent. Since each session is limited to ten riders, students are encouraged to sign up early. Day camp sessions will run from 8:30 am to 3:30 pm. 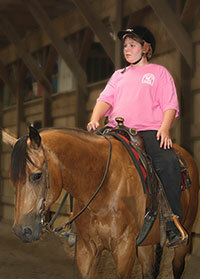 Riders will spend the morning in the saddle learning either balance seat or stock seat equitation. During lunch, we will review the morning riding lesson. After lunch, students will take part in unmounted instruction, followed by a second riding session. Extended hours are available for youngsters who can not be picked up by 3:30pm. Pickup each day scheduled for 6:30pm is an additional $50.00 per child per week. Every student needs to wear hard soled shoes with a heel and close fitting pants (e.g., jeans) or riding breeches if possible. Protective head gear will be provided for those who don't have their own. 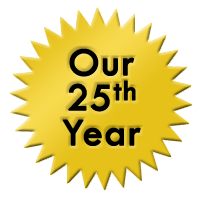 Our day camp rate is $495 per person per week. A $150.00 non-refundable deposit is due at time of registration. This will be applied towards the camp fee. For additional information, please call Cathy Tyler at 978-433-5252. 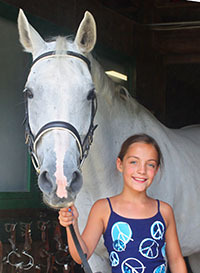 You are welcome to come and meet us and our horses before camp begins. Copyright © 2014, Twin Pine Farm. All Rights reserved. Site design by Rhino Hill Studios.